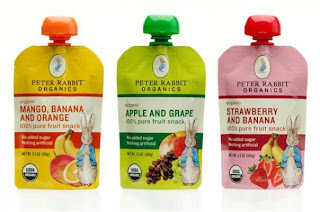 Peter Rabbit Organics fruit pouches are a really easy way to get some fruit into your child– or pack some fruit on the go, if you’re a big kid, like me. These fruit snack are 100% pure fruit with no added sugar and nothing artificial. They are USDA certified organic and come in three flavors: Strawberry-Banana, Apple-Grape, and Mango-Banana-Orange. The names of the flavors are also the ingredients lists- there is absolutely nothing added. The pouches are easy for little (and bigger) hands to hold, require no utensils, and good news, moms: they are also resealable! Unopened bags don’t need to be stored in the refrigerator. You can pack them in your diaper bag or a school lunch, or you can add them to your oatmeal, farina, or my personal favorite application, Greek yogurt.